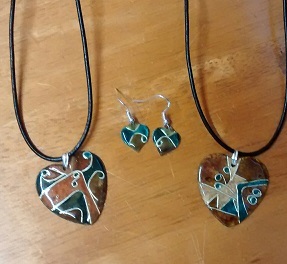 In this one day course – ideally suited to those who have attended my beginner’s enamelling class – you will learn how to apply wires to enamel and then fill them with glass to create the cloisonné technique. In this Enamelled Jewellery classs, we’ll look at Cloisonné techniques – that is building up a piece of jewellery by creating small cells with wire and then flooding them with enamel and firing. Cloisonné produces beautiful pieces of jewellery and tends to focus on transparent enamels – sometimes over silver leaf. Mainly Dates to suit so get in touch to organise this, although I do have a few dates to book showing on the drop down menu. Contact me to organise a date to suit. What a really lovely day! I came away with 2 necklaces I am really pleased with. The course is well structured with lots of information tailored to the recipients level of understanding. Toni is very knowledgeable and answered all my questions and from an experience. Great handout to follow up at home. I hope to be doing more courses!